For quite a while now, I’ve been suffering through something I might call abstraction angst. It’s hard to describe to those who haven’t experienced it, but you might get a little of the flavor if you imagine working at a bank, handling thousands and thousands of dollars per day, then finding a dollar on the ground on your walk home. It’s not that you don’t appreciate the dollar—it’s just that it’s hard to think of it as mattering much. In fact, you might even be in a kind of Pursuit of Happyness situation, where that dollar actually makes a whole lot of difference—and still have trouble caring much about it. If you really want to understand what I’m feeling, this article by Bret Victor might get you significantly closer. Essentially, Bret Victor ascends the ladder of abstraction, so that he can program video games in a way that’s both interesting and challenging to human beings. In doing so, he moves farther and farther away from what it feels like to play a game, or even to think about a game, and moves into a territory where the game itself is just one of many points in possibility space. But once you’ve reached that level, creating the game is just a few choices on a grid of possibilities—it’s not much like the creative process. And then, when you play the game, you’re aware that you’re just exploring one of a number of different paths someone else laid out for you to experience. You’re not really bringing anything new into existence—you’re not doing something the game creators didn’t foresee. Your gameplay is just one of the many different possibilities explored by the creators of the game beforehand. I imagine this is what some people feel when contemplating a photo of earth from far away. How can life be significant, when it’s so incredibly small in the cosmic order of things? For a while now, that’s what life has felt like to me. Of course, I recognized it as a fallacy—I should still be able to enjoy life even if it’s possible to think about it from a great height, or from very far away. Or in my case, at a very high level of abstraction. But recognizing something as a fallacy, and feeling it as a fallacy are two very different things. In part, the feeling is just from overwork, from focusing my mind too intently on intellectual challenges, and not spending enough time in the practical enjoyment of life. But getting out of that overwork rut is hard: I make a living by writing code, which is an incredibly abstract process, and I’m on a mission to work through a vast amount of philosophy, which is an incredibly abstract discipline, and my main form of self-expression is typing words onto a black screen, which is an abstract hobby if ever there was one. One of the things I’ve been thinking about lately is the trinity. I’ve been meaning to write something on it, and I’m sure I’ll get around to that eventually. The short story, though, is that although the trinity itself isn’t spelled out anywhere in the scriptures, from the earliest moments of Christian history, it was one of the most important and distinctive ideas in Christianity. Understanding why it became so important is itself quite an interesting story. My take on it is that the trinity emerges from early Christian experience. As good monotheists, Christians experienced God as transcendent, mysterious, and unknowable. This is the position of much of philosophical theism: there must be a God, but its true nature must be forever beyond us. Christians affirmed this thought and this experience. At the same time, Christians had experienced God in Jesus of Nazareth. In him, “the fullness of God dwelt bodily”, as they put it. They also affirmed this thought and this experience. And they had also experienced God among themselves. When they were inspired, when they seemed to reach beyond their place and situation, and experience true brilliance of thought and word and action, when their community seemed to exhibit a creativity and order far beyond the norm—they could say that God was among them. They affirmed this thought and this experience. The trinity is simply the affirmation and description of these experiences. The experiences could not be simply conflated—experiencing the Spirit among you was not the same as knowing the absolutely transcendent mind of the Creator. But neither could they be completely separated—as a matter of faith, Jesus had revealed that the core identity of the transcendent Creator was love. 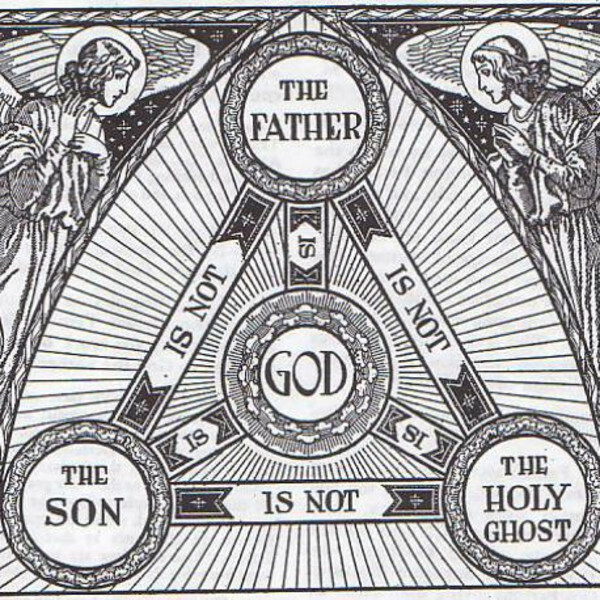 And so the doctrine of the trinity was formulated to affirm that these things were distinct, but not separate. I bring this up because it seems to tell us something about the creative process. In the trinitarian doctrine of creation, God the Father creates the world, God the Son is embodied within it, and God the Spirit brings new life out of it. We can think of God the Father as creating the world in an analytical and abstract way. It is a work of construction or programming or design. It is done from the outside. But once created, the world is not complete until the Son can be incarnated within it. Then it can be experienced from the inside. Then, according to Christian doctrine, God can truly understand us and relate to us as we are. I find it interesting that humans are so obsessed with creating virtual worlds. We’ve been doing this from the moment we started telling stories, but now we do it across all kinds of media, from books to radio to movies to virtual reality. And one thing that seems to be universal, is that when we tell a story, we have the impulse to place ourselves within it. In fan-fiction, this is called the Mary Sue—the character whose sole reason for existence is so that we (the authors or viewers) can see ourselves interacting with our heroes and favorite characters. But that’s a little dismissive—at some level, all stories are built so that we have a way of experiencing ourselves within them. With virtual reality, we now have the ability to do it almost literally. Why do we have such a strong desire to inhabit our created worlds? I don’t think it’s because of the quality of experience. Many critics of virtual reality think we’re on a mission to escape real life for an experience that’s much more enjoyable. And yet virtual reality to date does not get anywhere close to the quality of real life. I think it’s something deeper. I think, as creators, we have an impulse to incarnate within our creations. We are not drawn to virtual realities because they are better than our current experience, but because we have created them, and we are instinctively drawn to commune with our creation. It would seem that as creators of art, of words, of worlds, we find ourselves drawn into a trinitarian relationship with our creations. We create from a position of analytic and architectural abstraction, and then seek to experience our creations from the inside. You’ll notice that I left out the third member of the trinity. In western Christian thought, the Spirit proceeds “from the Father and the Son”. In the biblical account, once God has incarnated in the world, once both the Father and the Son are involved in the universe, then the Spirit is set loose in creation. Where the Father creates analytically and architecturally, and the Son experiences that creation from within, the Spirit acts to bring forth new things from the life contained in creation. The Spirit is not analytical, but emergent. The Spirit is in a sense the feedback loop of the Father and the Son, transforming and bringing forth the creative potential of existence, surprising and delighting all with new things that were completely unforeseen. In my own creative experience, this feedback loop is absolutely necessary. When you create from a position of analysis and abstraction, you may create something that makes sense, but has no life. When you lose yourself in the experience, you may create something amateurish and unwieldy, like a Mary Sue character, or a tearjerking song that simply recites bad things that have happened to you. But when you can maintain both—when you can analyze and create and experience all at the same time—then you experience something like inspiration. Then you’re shocked to find things emerging that you never anticipated or planned or foreknew, things which are your own creations, and yet are the surprising and spontaneous creations of new life. When I got there with my songwriting, when I was analyzing and crying and surprising myself all at the same time—that’s when I felt that the creative process was truly at work. That’s when I created the things I’m most proud of to this day. A few years ago, I lost my songwriting ability. Where it had come naturally to me for years, it stopped coming. And I could tell that what I had done was to stray too far, and lose myself in analysis and abstraction. But analysis is not something you can undo, exactly. You can’t unsee the things that you’ve trained yourself to see. Trying to get myself to stop analyzing seemed even more hopeless and quixotic than anything else I had done. So eventually I gave up and moved on to other forms of self-expression. In a sense, I may now be at a similar place with life itself. Striving to analyze too much, and losing my ability to create. But thinking about the trinity has changed my perspective on this. My problem is not that I have done too much analysis—it’s that I have done too little incarnation. I don’t need to try to stop analyzing, I need to learn to do more inhabiting. I need to analyze, create, and experience all at the same time. I need to create what I can simultaneously experience and enjoy. Only in doing so can I move out of abstraction angst, and move back towards understanding what things feel like. Only in doing so can I generate the feedback loop that enables true creation to come into the world. Only in doing so can I rediscover and re-embrace life. I’m not absolutely sure what that looks like yet. But it gives me hope that the creative process isn’t doomed to self-destruction, that new things really are possible, and that abstraction doesn’t have to lead to nihilism—but when placed in its proper context, can lead to ever more beautiful art, music, stories, and worlds. Where in this diagram do we go, or, are we somewhere else? Great article. I lke the way you point to the incarnational dynamic of creaivity. Really insightful.